For more than thirty years, I have been blessed to help thousands of families, friends and colleagues with their real estate needs – many of you are reading this newsletter article today. But as with life and business, things change including technology. We used to have home phone numbers, AOL chatrooms and pagers if we needed to reach someone quickly. Nowadays, home phone numbers are a thing of the past, text messaging has replaced pagers and we have a giant chatroom known as Facebook to connect us with those we love and care about across the globe. We love the advancement of technology, however, the way we connect with our clients has also changed, and in that process, we have lost important contact information for many of you. In an effort to reconnect with you in 2019, we have hired a customer service specialist to help us – his name is John. 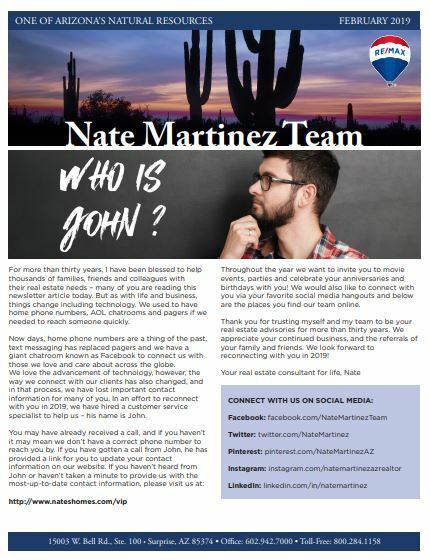 To learn more about John and the exciting new projects and listings we've got, please click here to download a full copy of the Nate Martinez Team February 2019 Newsletter. Thank you for trusting myself and my team to be your real estate advisories for more than thirty years. We appreciate your continued business, and the referrals of your family and friends. We look forward to reconnecting with you in 2019!